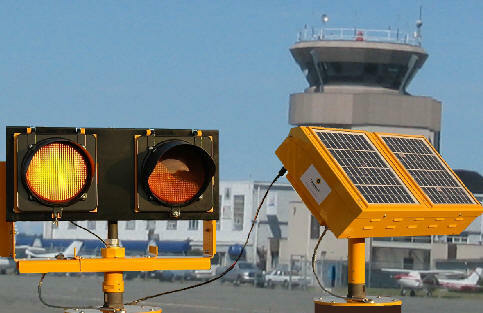 December 2, 2009 – VICTORIA, BC, CANADA Carmanah Technologies Corporation has received an order valued at approximately USD $365,000 to supply solar powered elevated runway guard lights (ERGLs) to an air force base in the Middle East. Carmanah ERGLs will provide 24 hour unidirectional flashing to aid in reducing airfield incursions at runway and taxiway intersections, improving safety and increasing operational capability at the base. As a portable or permanent stand-alone solution, the ERGL installs in minutes with no trenching, cabling, or external power required. Rugged construction delivers reliable performance in the harshest environments, withstanding extreme temperatures, rain, snow, ice, standing water, and wind velocities up to 300 mph (482 km/h). ERGL Solar Elevated Runway Guard Light easy installation: no specialized work crews required; limited air traffic disruption and functions immediately upon installation. Compact, self-contained design: easy deployment and relocation. Significant cost savings: no fuel or electrical bills. Reduced maintenance cycles: no scheduled maintenance for up to five years. Clean, renewable solution: a visible move towards eco-friendly practices. The Carmanah solar elevated runway guard light (ERGL) provides 24-hour unidirectional flashing to aid in reducing airfield incursions at unmarked runway and taxiway intersections. The ERGL installs in minutes with no trenching, cabling, or external power, and can be relocated just as quickly. An ideal choice for airfields that require improved safety measures, but experience difficulties with grid access, a solar ERGL makes it even easier to retrofit existing runways with this effective, preventative solution. Recently tested by the FAA at Dupage Airport, Illinois and Provo Airport, Utah, the Carmanah solar LED ERGL is designed to satisfy the structural and environmental requirements of FAA Advisory Circular 150– 5345 – 46B (L-804) and ICAO Annex 14 using solar power. Carmanah has been the industry leader in solar airfield lighting for civil and defense applications since 2002. Industry proven for reliable operation in a range of environments, Carmanah solar powered LED aviation lights are installed at some of the world's busiest airports including Chicago O'Hare International Airport, Dubai International Airport, Gatwick International Airport, Singapore Changi International Airport, Toronto Pearson International Airport, and at defense airfields worldwide. As one of the most trusted names in solar technology, Carmanah has earned a reputation for delivering strong and effective products for industrial applications worldwide. Industry proven to perform reliably in some of the world's harshest environments, Carmanah solar LED lights and solar power systems provide a durable, dependable and cost effective energy alternative. Carmanah is a publicly traded company, with common shares listed on the Toronto Stock Exchange under the symbol "CMH”.